As the communication focal point for Rural Finance, amongst the many aspects of rural finance, I have been following the topic of remittances. I have been reading up on the various projects and activities. One of the topics that really interested me was financial literacy. You never stop learning: Ever heard of financial literacy? The remittance team briefed me on the ‘Mobilizing Migrant Resources Towards Agri-based Cooperatives in the Philippines’. 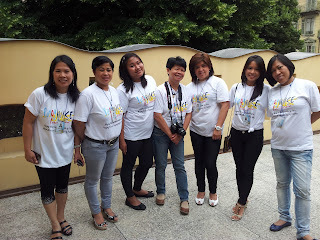 This a project that helps migrants from the Philippines who came to Italy as domestic workers and helpers to save and invest in agri-based cooperatives back home. Over the past many years, these migrants faced serious financial difficulties but now, with the help of financial counsellors, they are helping the next generation of migrant workers to be aware of steps they need to take to be able to manage their funds and be financially independent. This project was implemented by the Atikha Overseas Workers and Communities Initiative (Atikha). They joined hands with the Filipino Women’s Council who provides financial education to more than 5000 domestic workers and helpers in Italy. Thanks to the training received, over 1,000 migrant workers have invested in the Soro-soro Ibaba Development Cooperative (SIDC), the largest cooperative in the Philippines. 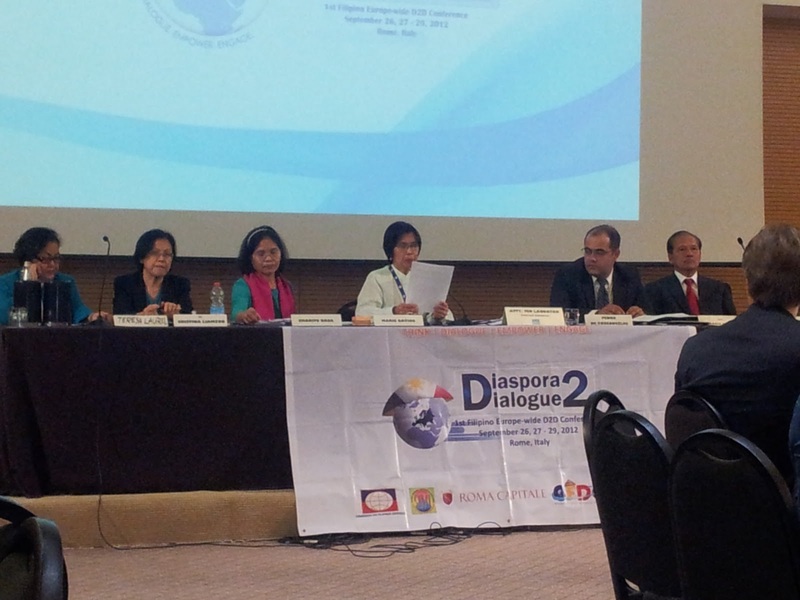 SIDC, Athikha and the Filipino Women’s Council launched the SIDC Investment Program. One of the many projects of this programme is the SIDC Egg Layer Program which has already raised 220,000 Euro for investment in agriculture. This amounts to 59% of all investment in SIDC in 2011. As investors, the migrant workers have a guaranteed return of 6-7%, considerably more than from any bank account. I wish they would allow me to invest as well… ! 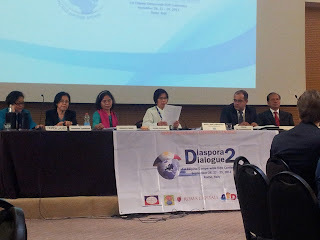 Recently I had the pleasure of attending the first Filipino Europe-wide Diaspora 2 Dialogue (D2D) Conference held in Rome. Minda Teves, the leader of financial literacy courses in North Italy, who I met in June when I participated in a financial literacy course invited me to this conference. My IFAD colleague Pedro de Vasconcelos, Programme Coordinator for the Financing Facility on Remittances (FFR), gave a presentation on ‘ Best use of Overseas Filipino Worker (OFW) Remittances: Community, National and International Development Programs’. A recent video that was filmed in the Philippines ‘Lily’s Story’ was shown as part of his presentation. Pedro gave IFAD’s perspectives on remittances, highlighting the programmes and success stories and explained how the FFR is helping to support developing rural investment opportunities for migrants and community based organizations. I met Minda Teves earlier this year when I participated in the financial literacy seminar, she introduced me to Jocelyn, Marjorie, Nerisa, Rhodora, Rosalie, Gina and Kristine who are her fellow trainers and believe me it was an honour to meet these remarkable women – they are a group of industrious and intelligent women who came to Italy from the Philippines . They left their villages many years ago hoping for a better life for their families. Today these eight women live and work in Torino. They have full time jobs as domestic helpers but they also each have another important job: they are financial counsellors or trainers, teaching other migrant women how to manage funds and work towards their dream future. Teves is is a powerhouse. When she first came to Torino over 20 years ago, she was supporting 26 family members! She was working seven days a week and yet could not earn enough money to send home. As the pressure mounted on her, although she was feeling hopeless, she decided to turn her life around and went for a training course on financial literacy, eventually becoming a trainer herself. Minda often says “I have to realize that our situation as a migrant is just like a … “bird in a cage… with the head outside. The bars imprisoning us are the work conditions that we have to follow, the responsibilities towards our family back home and to the family here, the cultural shock, language barriers, low self-esteem, fears, etc. The financial trainers are in the right place and at the right time, many of the migrant women who are earning money in Italy are eager to learn from them about the concepts of savings, investments, budgeting and financial planning. Since the training is delivered by members of the community, they take into account their own social and cultural backgrounds. It was so moving to see the loyalty to their community and country, especially when they sang their national anthems with their heart at the beginning of each day. Another impressive fact was their solidarity. The trainers shared their delicious home cooked food with the participants The participants received complete information material and workbooks. I was so impressed on their meeting facilitation techniques… They used icebreakers at the beginning and energizers during the breaks. They had put together a well-structured programme that covered all aspects of financial planning. Teves has created a Facebook page called Northern Italy Financial Counsellors with over 500 members and it serves as their meeting point. Teves has a full-time job as a ‘helper’ . This means she only has Sundays to dedicate to the Filipino community. Apart from being a financial counsellor, in 1996 she established an association called ACFIL ‘Associazione Culturale Filippina del Piemonte’. This organization aims to strengthen solidarity among Filipinos in the region, promoting their native culture, , organizing work and social activities. 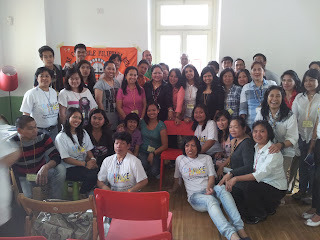 Teves manages ACFIL’sa monthly newsletter and acts as the focal point for all the activities in the community. It was an overwhelming show of solidarity and human bonding between people who had come a long way away from their homeland to support their families. I came away from this one-day seminar admiring their strength, at the same time feeling humbled. The trainers are not only professional and skilled, their dedication to their community and country is extraordinary. These trainers themselves had their share of negative experiences when they were in great difficulty after having ‘sent all their money home’. They didn’t know then what financial literacy meant . These women have a strong sense of community and want to ‘give back’ by sharing their experiences and teaching participants that while remittances provide a life line for their families, they are also essential for the development of their communities and country. And the migrants need to learn that taking care of their own needs is equally important as the families’ needs. This was a valuable message emphasized by the trainers. Too often being so far away makes it difficult for them to turn down requests from our families and the challenge is to set priorities and learn to say ‘no’ to meet their own goals.